Tillerson Goes to India: A New Phase in India-US Ties? Rex Tillerson’s inaugural visit to India will set the tone for the next phase in U.S.-India ties. U.S. Secretary of State Rex Tillerson will be in India this week as part of his three-nation tour to South Asia to reinforce the point made repeatedly by the Trump Administration that it wants robust ties with New Delhi. Tillerson already laid out the broad contours of this administration’s India policy in a speech last week where he underscored the reasons why India-U.S. relations have seen unprecedented growth over the last few years. 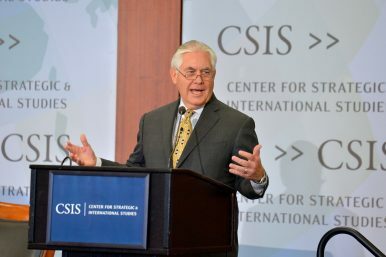 At a time when there are some concerns in India about the transactional nature of the Trump administration’s foreign policy approach and a sense of impending isolationism in the garb of ‘America First’, Tillerson’s speech made it clear that the power shift in the larger Indo-Pacific remains at the center of American external outreach and India’s importance in that matrix remains as pivotal as ever. During Tillerson’s visit this week, regional issues will dominate the agenda and Washington would be keen to assess how New Delhi views its own role in both in the ‘Af-Pak’ and Indo-Pacific theaters. The Trump Administration’s South Asia policy has already called for a substantive role for India in Afghanistan and Tillerson’s speech has underlined an expansive role for India in the wider Indo-Pacific. “In Washington’s new South Asia policy as sketched out by Tillerson, the U.S. intention of turning New Delhi into a stronghold to counterbalance Beijing could not be more obvious,” it suggested and underlined that while China is not against India and U.S. extending their bilateral ties, it will not tolerate any move that is intended to work against the country. Tillerson’s visit to the region will allow Washington and New Delhi to get a first hand assessment of each other’s priorities at a time of unprecedented shift in regional and global politics. While India will be assessing how far the Trump Administration will go in operationalizing its rhetoric against Pakistan and China, the United States will be looking at the Modi government’s response to its overtures. It remains to be seen if India can take advantage of this moment to carve out a larger regional and global role for itself. The Modi government is keen to move India away from being a balancing to a leading power and the Trump administration is signaling that it is ready to help India achieve its ambitions. In the past too successive U.S. administrations from George W Bush onwards had been positive about India’s global rise. But it was New Delhi which was coy of emerging out of its South Asia cocoon. The Modi government is unabashed about its commitment to see India emerge as a powerful global actor. It now needs to seize the moment.